Toyohara Kunichika (1835-1900) Magic in the Twelve Signs of the Zodiac: Sheep - Iwai Hanshiro as Princess Terute, 1877. Oban. 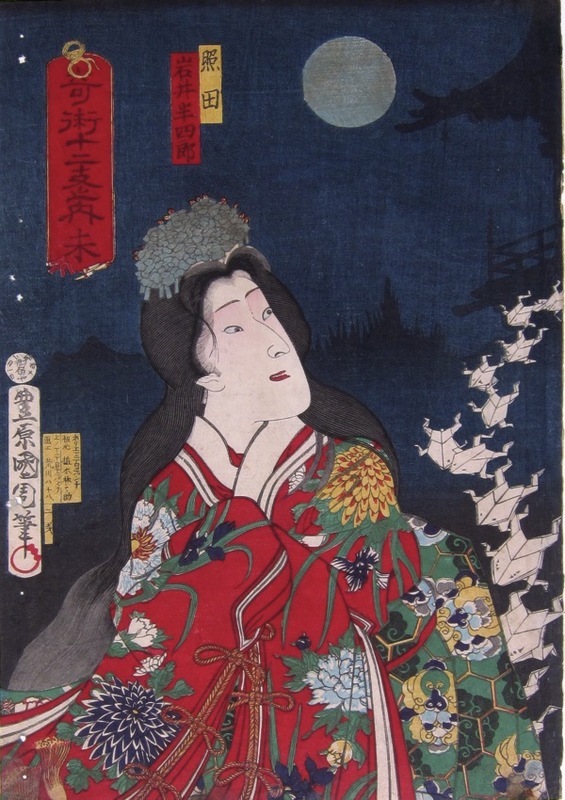 The series borrows very heavily from Kunisada’s 1862 series A Contest of Magic Scenes. This print is anomalous in as much as the subject appears to be the frog or toad and of course these animals are not among the twelve creatures selected by the Buddha that comprise the Japanese zodiac. Confusingly, Princess Terute is not associated with these creatures either. The origami frogs that are marching rather beautifully across the background are borrowed from the portrait of Jiraya from a late Kunisada series, Toyokuni manga zue of 1860. The cartouche in the upper left of this series carries small clues in the border as to the subject of the print. In this case there are what appear to be horns and coils of rope. There is therefore the possibility that this print represents the sheep and the origami creatures a poor effort at representing them as well. The sheep was not native to Japan and really never appears in ukiyo-e. This is a beautifully produced print, fine condition, mounted on Japanese album paper, the colour is very fine as is the impression.